How decision Makers use songwriting to rethink innovation. How 100 top decision makers utilize songwriting to reflect their business story. 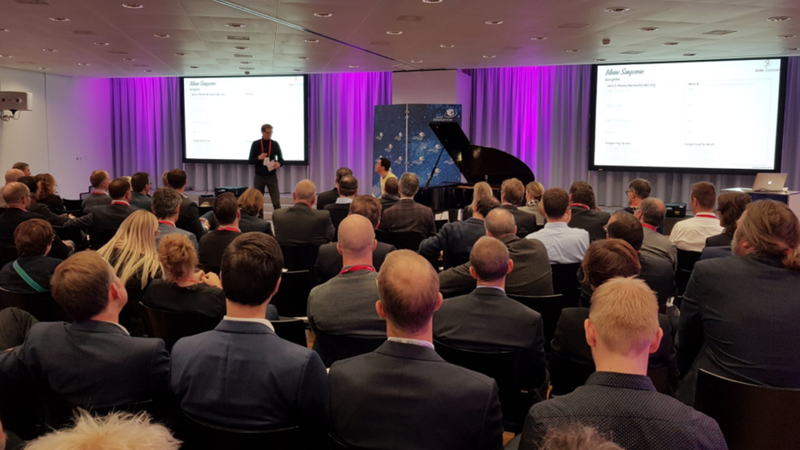 Johannes Flecker of Sound Leadership provided a creative songwriting session for 100 workshop participants at the Swiss Innovation Forum in Basel, Switzerland. Innovation starts with a dream. Based on the conference topic "Dream. Creativity. Design. Innovation", the songwriting session focused on the process and product of songwriting: Songwriters are innovators who make their dreams reality. Songwriters constantly create and write their ideas in the form of songs. How do organizations ensure to express the ideas of their employees continually and create a climate of proactive co-creation? A song must be performed in order to be heard. Many ideas in organizations remain in drawers because of a lack of incentivizing the expression of ideas. Most songs are not successful. Great songwriters have an intrinsic mechanism to continue writing and expressing themselves despite numerous setbacks. What can organizations do to encourage failing quickly and moving on? Through continuous improvement of their craft, songwriters boost their chances for success. How do organizations make sure to produce a large number of possible hits to finally achieve one? Immerse in the process of songwriting. During the one-hour-session, the 100 workshop participants created song verses and a song title on their own, describing and expressing their state of innovation culture in their own organizations. Several participants performed their verses, accompanied by Sound Leadership's Johannes Flecker on the piano, creating the perfect groove for their story.